Hot Rod Jakob is a unique combination of classical car-building craftsmanship allied to modern technology and design. In February 2008 the car will be unveiled at the Volvo Museum in Göteborg before setting off on a tour of the Nordic region and the USA. 1925-1926: The prototypes of what would eventually become the first Volvo slowly take shape in a simple workshop on the island of Hisingen in Göteborg on Sweden's west coast. Volvo's enthusiastic founders Assar Gabrielsson and Gustav Larson and their skilled craftsmen proceed with immense skill and precision. They design and engineer all the parts themselves. They test-drive and make changes in preparation for the next prototype. And in doing so they lay the very foundation for the excellent quality reputation that has been a Volvo trademark over the decades. On April 14, 1927, the very first series-produced Volvo car leaves the factory that was built alongside the workshop. The model is called the ÖV4 (the Swedish abbreviation for Open Car, 4 cylinders), but it soon gains a new pet-name - Jakob. 2005-2006: In Leif Tufvesson's workshop in the rural south of Sweden, work gets under way in earnest. After documenting the original in detail, his company Caresto starts building a car that will develop into Hot Rod Jakob - his personal interpretation of that very first Volvo. He harnesses the full width of his knowledge, which has already won him awards such as "Hot Rod of the Year" and "Most Innovative Car" in that Mecca of Hot Rods, the USA. On December 18, 2007, in a perfect grand finale to Volvo's 80th jubilee celebrations, the car is first revealed to Volvo Personbilar Sverige's highly impressed top management. "Volvo has always been a special make for me. These were the cars I learned my skills on in my youth, and I also worked for a while at Volvo's concept-car department. So instead of obtaining inspiration from an old Ford, as is usually the case in Hot Rod circles, I wanted to build something that meant more to me personally. That's why I chose to bring together the most classic attributes of Volvo, the Jakob, and my own modern Hot Rod style," explains Leif Tufvesson. Parked side by side, the similarities between old and new are remarkable. The curvature of the bonnet has exactly the same radius. The characteristic windscreen attachment pillar that runs down the body side follows the original in detail as regards dimensions, materials and the number of screws used. Equally identical is the radiator grille with its characteristic mesh pattern and diagonal bar that incorporates the classic iron symbol. The body has been built by hand from raw aluminium panels that were bent into their final shape using a hammer and English wheel. Exactly as it was done in the prototype workshop back in the 1920s. That said, however, the differences are naturally also obvious. Hot Rod Jakob is far smaller than the original. It is a two-seater instead of offering space for four. And it has those typical Hot Rod attributes: large wheels, no wings and a muscular rear axle. And if you get a bit closer it is possible to see differences in terms of materials and details. The chassis is built of lightweight carbon fibre, just like today's most advanced racing cars, not from heavy steel beams as in bygone times. The brake discs are remarkably slim, but their huge diameter (450 mm front, 515 mm rear) guarantee that the braking surface is still going to be more than sufficient. The wheel spokes are made of aluminium instead of wood, but they are exactly the same in number. The massive tyres with their specially milled tread in the form of Volvo's iron symbol give an assertive, modern aura, while the charming luggage compartment at the very front - in actual fact an elegant leather case - instead conjures up images of white suits, straw hats and wide skirts. 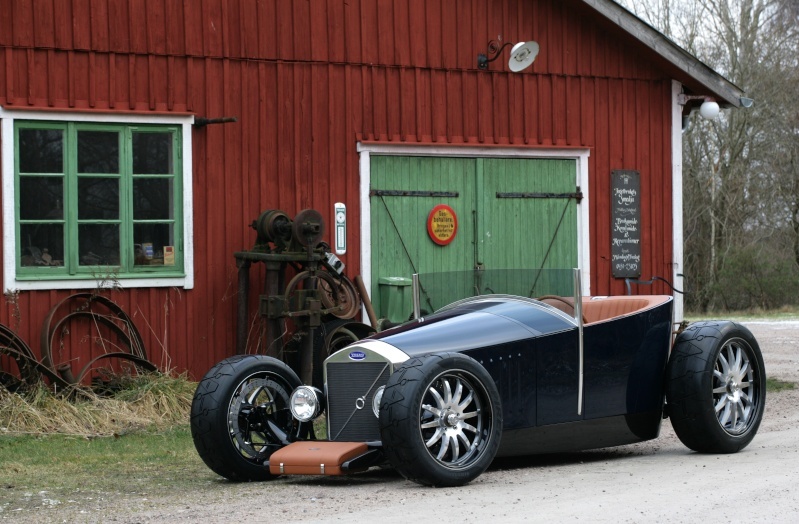 The entire build is typical of Leif Tufvesson's style. Lean. Aesthetically elegant. Stylishly minimalist. Largely because most of the components have been hidden away inside the body. For instance the springs and dampers, the electrical components and exhaust system. The result is that the body and axles look like they are floating in the air. A closer look at the seating compartment reveals deeply rounded backrests instead of a single flat bench, creating a robust and sporty atmosphere. The seats are upholstered in light brown hide. The piping, the upright rifling on the backrest, resembles the original, while the perforated flat upper section behind the seat echoes more modern styling cues. A glance at the instrument panels reveals no conventional gauges. Instead, all the functions are gathered into a single, in-house-developed instrument to the right of the steering wheel. The dial face changes colour and function when pressed. Press once: the ignition comes on and the button glows red. Press the clutch and the button turns purple. Press once more and the engine fires up smoothly at the same time as the button's colour turns Volvo Blue. "I really love combining old solutions with my very own ideas. Creating a fine balance between high-tech and tradition that works seamlessly. Dusting off old parts to renovate a car to original condition is not something that appeals to me," says Leif Tufvesson.But there are nonetheless a number of classic Volvo parts in the Hot Rod Jakob. The steering wheel comes from a 1962 P1800, as do the gear lever gaiter and steering column. The brake pedal and brake master cylinder are from the 140 Series. Supplied by Volvo Genuine Classic Parts (Volvo has one of the industry's widest ranges of genuine manufacturer's spare parts). The M90 gearbox is Volvo's last rear-wheel drive variant and comes from a Volvo 960. The engine, on the other hand, is brand new - a powerful Volvo T5 converted to run on eco-friendly ethanol, all so as to underline the lifecycle approach to this entire project. The Hot Rod Jakob project has challenged not only Leif's skills as a car builder but also perceptions of the Volvo brand. Just how does this car fit in with the image of safe, secure Volvo? "Absolutely perfectly, in fact. We have for some time now been moving Volvo towards a more daring design language. The Hot Rod Jakob does of course go its own way, but I regard it more as a work of art than as a Hot Rod. The car is built with the very same Scandinavian design tradition as our modern Volvo models. Lean elegance, yet in a way that sticks out," says Volvo Cars design director Steve Mattin. "That was exactly what made it so exciting. The paradoxes in the project. Challenging the usual perceptions of Volvo. And showing that it is perfectly possible to balance modern design and technology with classic Volvo and Hot Rod traditions," answers Leif Tufvesson when asked the same question. After being unveiled at the Volvo Museum in Göteborg on February 26, 2008, Hot Rod Jakob will be exhibited at the four Nordic winners of Volvo Best Partner 2007. In November Hot Rod Jakob will visit the SEMA show in Las Vegas in the USA. Chassis: Carbon-fibre chassis. Steel subframe to carry the engine. Front suspension: Live front axle with built-in steering gear. Concealed control arms, spring struts featuring coil-over gas dampers. Colour: Similar to Volvo Jakob Blue. The exact name and colour code of the original have been lost over the years. Interior: Hand-sewn light brown smooth and perforated hide. Foam padding. Classic vertical piping in the backrest. Engine: Volvo T5, five-cylinder petrol engine with light-pressure turbocharger, installed longitudinally. Flexifuel conversion so it can run on both petrol and ethanol. Power output: 265 horsepower. Torque: 370 Nm. Max output: 185 kW. Gearbox: 5-speed manual M90 gearbox (Volvo 960). Brakes: Specially manufactured brake discs fitted to the wheel rims. Diameter: 450 mm front, 515 mm rear. Twin four-pot callipers per disc. Front wheels: 10x22" AEZ Forge rims. Rear wheels: 8x19" AEZ Forge rims. Front tyres: Pirelli Scorpion special 225/55/19. Rear tyres: Pirelli Scorpion special 295/40/22. Exhaust system: Concealed installation of 3" stainless full-flow exhaust system with racing catalytic converter.